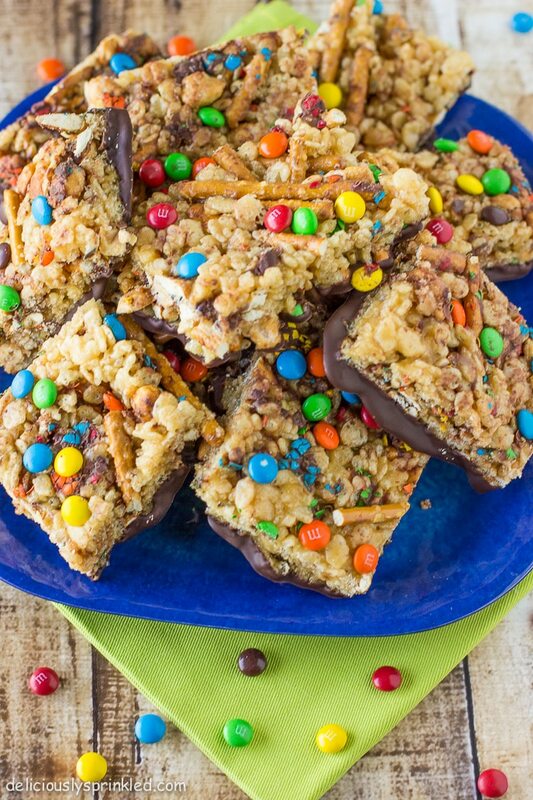 These no-bake Trail Mix Peanut Butter Bars are the perfect sweet & salty snack for on-the-go! When the weather starts to get warmer, I am all about making no-bake treats so I don’t have to heat up the kitchen. 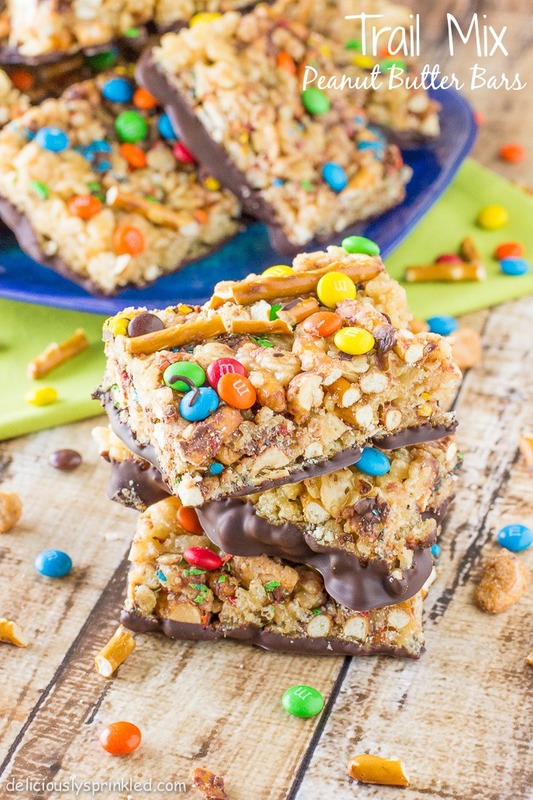 And these Trail Mix Peanut Butter Bars are the perfect snack bar made with crisp rice cereal, peanut butter, pretzels, peanuts and M&Ms and dipped in chocolate! These bars are defiantly loaded up with all my favorites from the delicious traditional trail mix. And that’s the best thing about these bars, is that you can add any of your trail mix favorites, or you can leave out all the mix-ins and simply just make peanut butter chocolate bar. The options are endless, and that’s why they’re the perfect snack! 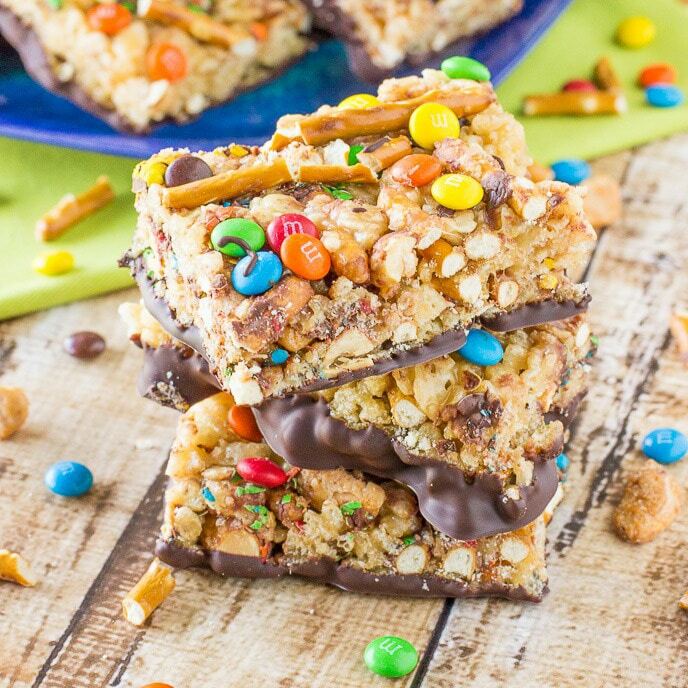 These bars are easiest snack bars I have ever made, all you need is crisp rice cereal, creamy peanut butter, light corn syrup, pretzels, peanuts, and M&Ms. I mixed everything up in a large mixing bowl and pressed them into a large baking pan. I used a piece of waxed paper to spread the bars evenly in the pan but you could also use a spatula sprayed with non-stick cooking spray. And that’s it, now it’s time to enjoy these delicious sweet & salty snack bars. Trust me, they won’t last very long! Line one 15in x 10in pan with waxed paper. Set aside. In a large microwave-safe bowl combine the sugar and corn syrup. Microwave on hight for 2 minutes. Stir until sugar is dissolved. Stir in peanut butter until blended. Add cereal, pretzels, peanuts, and M&Ms; stir until coated. Press into prepared pan, using a piece of waxed paper or a spatula sprayed with non-stick cooking spray. Place in refrigerator for 5 minutes, this will make cutting the bars into squares much easier. Once cooled, cut bars into squares. In a microwave-safe bowl, melt chocolate in the microwave for 1 minute; stirring until completely smooth. Dip the bottom of each bar into chocolate and place back on baking pan. Once all bars are dipped into chocolate, place pan back into refrigerator for 10 minutes, to let the chocolate set before serving. We made these for a baby shower a few weeks ago and they were so good! Almost like a Reese’s but with more crunch and tasted even better 🙂 I also did your snicker doodle cupcakes as well but added some banana. Yum! I LOVE this recipe and have pinned it so I can make it this summer. It’ll make my daughter so happy! This would be dangerous to have in my home. Sweet and salty snacks always disappear quick! No-bake and loaded with sweet and salty goodness? Yum! If I ate processed food I would jump on these fast! So colorful! I’m loving that salty/sweet combo. These look awesome! I’ll definitely be making them to bring to the pool this summer. These look great! Crunchy, sweet , and salty all in one! The chocolate dip makes these bars extra special. 🙂 Pinned to make soon! The best of trail mix in bar form and your photos are gorgeous! The kids would be all over these party in a bar and probably would not stop at one. Love, love, love! I can not wait to give these a try! These are just awesome Jenn! Love that you dipped them – my boys go crazy for that 🙂 Pinned! These sound awesome! What a great idea! do you think honey might work in place of corn syrup? I need to have these around to snack on in the afternoons! I haven’t made bars like these in such a long time! They’re definitely on the list for the next time the grandkids come to visit. Homemade always rules ion my house. Then we can make variations and it’s a lot less expensive and I can avoid tree nuts and use sunflower butter for my little guy. Yours looks really good! Homemade trail mix and bars are the best. Can’t beat a sweet/salty combo. These look awesome! My kids would LOVE these! Perfect on the go snack for summer! My daughter would go absolutely BANANAS for these! Have you ever had Kudos bars? That’s what these remind me of! I’m loving them, Jenn! That was my thought exactly – I used to love those bars! Yum! These bars look delicious, and so colorful too! Love the flavors. Pinned!